Pipes, developed by Synesthesia Corp, is a sample playback device that brings the power of a laptop to the stage. It also uses new technology to switch between multi-GB sample sets instantly. The new Swiss army knife for the studio and stage? Pipes by Synesthesia packs a massive onboard sample library and connectivity for multiple devices. Pipes is billed as the centrepiece of a live electronic music setup. 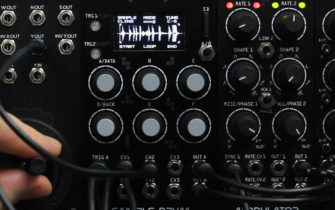 It can accept any kind of MIDI controller (or many at a time), with the stereo analog outputs feeding a recording device or a DI in a live show. It’s loaded with Tweakers (including arpeggiators, after swell, and a beatmaker) and Effects (including distortions, delays, filters and modulators), all which can be controlled via MIDI messages. The included samples are 48kHz/24 bit audio files and you can download your own samples to the device via WiFi. Find out more via their Kickstarter campaign.